Bonnie and Tom Griswold hastily married 15 years ago since he was called into military service before they could have the wedding they truly desired. But, their love grew even stronger through the years as they were blessed with five children. So, they knew that it was time to have a wedding ceremony which had always been their dream. 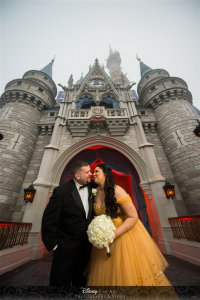 Their children and the Bride’s mother joined them at the Walt Disney World Grand Floridian Resort for a magical vow renewal celebration marriage ceremony Officiated by Rev Joy Blessing of Sensational Ceremonies. The children and Mom joined in a “circle of love” to commit to love and care for one another for the rest of their lives. Tom and Bonnie wrote to Rev Joy Blessing what they loved most about each other. Rev Joy Blessing included their words in a ceremony filled with tears, laughter, scripture readings of God’s love, spiritual inspiration and much love. Tom is the most laid-back person I know. The best thing about him is his sense of humor. He is witty and fun-loving. He makes me laugh every single day of my life. He never lets anything get him down. I can’t think of anything better then to spend every single day of the rest of my life with somebody who is so positive and so happy and just enjoys life. Anybody who meets him will tell you the same thing. I am without a doubt the serious one in our relationship -but thankfully his lighthearted disposition rubs off on me everyday and keeps us both young and playful. Oftentimes, people with these traits—may not handle responsibility well, BUT not Tom. Tom is also the most supportive person I know. He works very hard, to take care of his family financially. He never complains either. And when he comes home at the end of an 8- hour, 12- hour or 16- hour shift, he spends every minute with his wife and kids. He lifts my spirits when I am feeling down, he knows me better than I know myself, and he loves me truly and unconditionally. He is incredibly helpful around the house, a true partner in every aspect. He loves to cook and makes delicious meals for us on his days off But, above all he is always there for his kids. When Andrew wants to play football in the back yard or learn about fantasy football, or when Noah needs help downloading a new game, or when Adam needs his bike seat adjusted, or when Jenna is afraid to sleep in her own room, or in the middle of the night when Emily wakes up for her cuppie…they can always count on him for the big things and the small things. The way to my heart is through my kids, and that is a huge part of why I fall more and more in love with him every day. Words that I would use to describe him are: ambitious, humble, fun, strong, handsome, protective, and above all….Lovable. Over the last 15 years, I thank God every time I pray that he delivered Bonnie to me. Bonnie has filled my heart with so much love; love that I only thought existed in the movies. She has such a big heart and is beyond dedicated to me and our five children. Our love grows stronger every day and she not only brings joy and happiness into my life- but has brought me closer to God. Bonnie has shown me and our kids who God is. We decided to homeschool our children so Bonnie left the workforce and dedicated her time and love for our kids and God into homeschooling. I think this is an amazing sacrifice she made– and our kids have been thriving since that day. Bonnie has found a curriculum that is all about God and based on the Bible. We have all learned so much about the Bible and God just from homeschooling the children. I can say that this has had a big impact on all of us. Bonnie has shown me and the kids the love of God and has brought Jesus into our lives–and there isn’t a better thing in the world anyone can do for us than that. I am internally grateful to my beautiful wife for that. Bonnie and I are perfect for each other and believe without a doubt that God brought us together— after all He leads the way and doesn’t make mistakes. I love the fact that the Bonnie idea of fun is -just being together as a family …and sitting home playing board games –and going on trips like to Disney World. Me and the kids are all she needs —and I find that makes me feel like the luckiest man alive. I love that every day when I go to work the kids are in the best loving and educational environment possible thanks to Bonnie. Bonnie has surpassed any expectation that I could have imagined as a Mother and a wife– and I love her with every morsel of my soul. We are without a doubt soulmates.